The death of a loved one always hits us hard, like a tsunami that sweeps everything away, leaving the land barren and broken. We are thrown into a great darkness that feels void of everything we’ve trusted and loved. Our impulse is to turn away from death, turn away from pain, and find refuge in the darkness, a darkness so dark that you could slice it with a knife. In the darkness, we slowly attempt to unravel the trauma and deal with our anger, despair, and loneliness. In the darkness, we feel the extent of death’s devastation, but we also discover what we need to do. In my fourth year at the seminary, I lost two significant persons in my life, both of whom I had loved dearly; a maternal grandfather and a former spiritual director. In my grief and confusion, it was easy to seek the companionship of darkness, “my old friend.” It was here in this darkness that I thought I could find the means of rebuilding my life from the ashes. Ironically, it is the very darkness that forces us to search for the sliver of light that survives in the rubble of our hearts. One night, still reeling from the sudden loss of these two luminaries in my life, I took a short walk up to the hill located behind the seminary. A black-out had plunged the whole island into darkness. While others found the whole experience inconvenient and even eerie, I welcomed the darkness as it somewhat resonated with my personal mood. In the darkness I discovered something which I had often taken for granted. 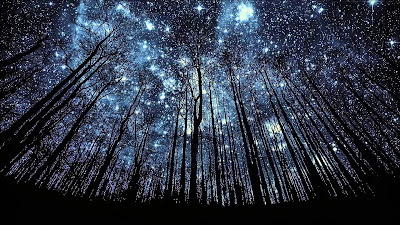 If you are an urbanite like me, seeing stars in the sky was a rarity. Light pollution usually gets in the way. But on that darkened night, my naked eye could see for the first time, thousands of stars, it was as if the whole Milky Way had just emerged from behind a curtain. It was so incredibly beautiful. Then it dawned on me that I was not alone in the darkness. Light shone in the midst of darkness and the darkness, no matter how seemingly over-powering, could not overcome it. The people who lived in the Galilean areas of Zebulun and Naphtali, mentioned in both the first reading and the gospel, also experienced a distressing darkness. When Isaiah uttered the prophecy which we just heard in the first reading, this area was located under a shadow of darkness. The Assyrian army had overrun it and was oppressing the inhabitants with every type of violence. The people lived without hope or consolation. The gloom that had settled over the land penetrated right into the heart and soul of every inhabitant and rendered the continuation of human life impossible. But this darkness was not Isaiah's last word. The prophet envisioned a light, a glimmer of hope. He saw the darkness and gloom giving way to radiant light and joy. The people living in the shadow of despair would have been looking ahead to this moment, anticipating their own liberation. Finally, the light did appear on the Galilean mountains, but only 700 years later. The light, as St Matthew tells us in today’s gospel, is the illuminating word of Jesus, who began His preaching in Galilee and slowly began to spread it outwards. As Jesus moved along the shore of the Sea of Galilee, and on the Sea itself, He shed light onto the lives of many people who had experienced the ravages of war, occupation, violence, failure and abandonment. Wherever the gospel was preached, darkness was driven back. St. Matthew sees in the very ministry of Christ the fulfilment of Isaiah’s prophecy. “Land of Zebulun! Land of Napthali … The people that lived in darkness has seen a great light; on those who dwell in the land and shadow of death, a light has dawned.” As so perceptibly pointed out by St. Augustine, this episode like so many others demonstrated the truth that “the New Testament is hidden in the Old and the Old is made manifest in the New.” Saint Gregory the Great also taught that “what the Old Testament promised, the New Testament made visible; what the former announces in a hidden way, the latter openly proclaims as present”. If all this seems too lofty and ephemeral, Jesus made that pilgrimage from darkness into light even more concrete and specific. He saw two brothers, Simon and Andrew, fishing. He said, “Follow me, and I will make you fishers of men.” Even though St. Peter was aware of his own sinfulness and brokenness, and that he was living in darkness, Christ called him. And he left the darkness behind, he left his boats, he left everything immediately and followed Christ. As did his brother Andrew. As did James and John moments after. To follow Jesus, to embrace His way of life, was to leave the darkness behind and live in the light. But that was just the beginning for the apostles. In the Sermon on the Mount, Jesus would remind them that they “are the light of the world, … let your light shine before others, that they may see your good deeds and glorify your Father in heaven.” So they accompanied the Lord in His missionary journey, passing on the light of His teaching and curing every disease, showing others that just as He took them from the darkness of ignorance, suffering and pain into the light of knowledge and health, so He wanted to take their souls from the darkness of sin and doubt, the gloom of depression, the pall of grief, into the radiance of a life changing relationship of love with Him. Just as He had called these first disciples, it is crucial for each of us to recognise this personal call that Christ makes to us, to leave any and all darkness behind and follow Him into the light, to live and walk always illumined by Him. The Lord summons us to follow Him into the light so that we, in turn, can become His light. The light of the world, illumining the paths of others to Him, and through, with and in Him, enter into the dazzling and eternal light of God’s abiding presence. Discipleship is thus heeding the call to walk and live with Christ to follow Him on that pilgrimage out of the gloom and darkness of our existence. If there is anyone here today who still walks in that darkness, do not grow too accustom to it. When you spend too much time in the darkness, you will eventually find it more comfortable than the light. Come to His light — walk no longer in darkness! No matter how difficult things may seem, no matter how bleak, no matter how dark life may become, His light shines in the midst of darkness and the darkness can never overcome it.